Posted on May 28, 2018 at 3:56 pm. You open the door to the basement, and your worst fears are confirmed: You’ve just become the owner of an underground pond. Flood cleanup may be a DYI project, or it may require expert help from contractors. Whether excessive rain or a burst pipe is to blame, it’s alarming to see inches of water where the floor should be. Treasured belongings become garbage, and the foundation of home can be threatened. It’s tempting to wade right in and salvage what you can. The number one rule of dealing with a flood is to stay out of it. That flooded basement contains electrical outlets, and to step into the flood water is to risk deadly shock. This problem is compounded if the electrical panel is located in the basement. In this case, it will be necessary to pump the basement before entering. Even then, you may want the fire department, an electrician, or another professional to help. You should assess damage and make a plan only after the risk of electrocution has been eliminated. Reminder: STEP ONE is always to stay out of the water if there is any risk of shock. 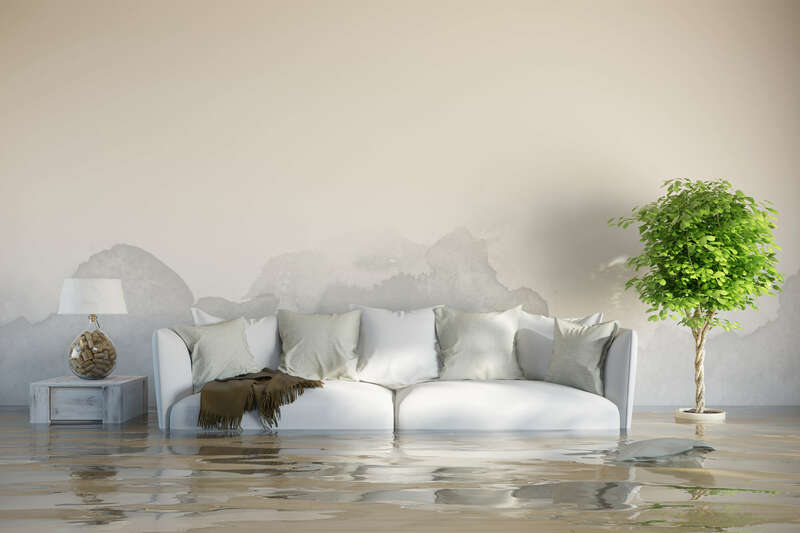 Before entering a flooded interior, it’s a good idea to disconnect the home from the power grid. Even after taking this crucial step, be sure not to enter deeper water alone. If you must, step carefully, and be sure to take along a strong battery-operated light source. STEP TWO: Get rid of the water. A small amount of water can be drained using a heavy-duty pump. In a major flood, your best move is to call in a professional team to help drain any standing water. STEP THREE: Throw out flood-damaged appliances. You should never re-use electrical fixtures or outlets that have been in a flood, since they will not be safe to operate. The same goes for any gas appliances, like a water heater. If an electrical or gas appliance has been submerged, it shouldn’t be used again. STEP FOUR: Remove textiles, papers, drywall, and other mold attractors. Mold can be dangerous, or even deadly, in a home. Mold spores are microscopic, and mold only becomes visible when it exists in large concentrations. Mold can cause respiratory distress, allergic reactions, and even lung disease. Mold thrives in damp, porous materials. Although it’s hard to jettison a favorite carpet or couch, once these have been submerged in flood waters, they can pose a threat from mold. It’s best to throw away any books or papers, any plush toys or pillows, any soft furniture, and any drywall or ceiling tiles that have been touched by a flood. Mold can also exist in tricky, less obvious spots, like the insulation in appliances, refrigerators, or air filters. Additionally, water can wick into porous surfaces, so that it may be necessary to replace drywall a few feet above the waterline. This is a big undertaking to manage alone, so call in expert professionals to help with mold removal and cleanup before you begin to repair and rebuild. STEP FIVE: Clean the hard stuff. The Federal Emergency Management Agency suggests a 10 percent solution of bleach in water and detergent to wash down walls and floors and any non-porous items, like ceramics, glass, metal, or plastic. Remember: If you aren’t sure what can be salvaged and what can’t, let a professional team guide you through this part of the process. STEP SIX: Take steps to avoid future flooding. Waterproofing a basement, replacing worn-out pipes, removing absorbent debris from beside the foundation of the house—do what you need to do to keep your interior spaces dry in the future. Flood damage can take a lot of work and money to remedy, so it’s good to take action now to avoid similar problems in the future. Some steps of the flood recovery process require only energy, elbow grease, and soap. Others are best handled by a professional, particularly when safety is a concern. But you can bounce back from a flooded home while also taking steps to ensure it never happens again. A flood can feel devastating, but you don’t have to deal with it alone. If you need help, call the flood restoration experts. Rogers Home Improvement has been serving the Terre Haute, Greater Wabash Valley, and Eastern Illinois areas for more than 25 years. We’re here to help if you need it.